Rome We started out the day with a run by the office where we are “bunking” for free to meet three tenants from Rome who were making the final decision about joining ACORN Italia and “registering” their landlord, which means putting his property on the state tax rolls and off of the black market. They left the meeting with David Tozzo, ACORN Italy’s head organizer, raring to go. By doing so they will pay their small share of back taxes, but will also save 90% of their rent for the next 8 years. Thus far our Tenant-Landlord Registration Campaign has won similar savings of over 4 Million Euros and gained us pages of publicity and members all over Rome, but also in Venice, Turin, Bologna, and elsewhere in Italy. For a treat we then bused into the center of Rome and visited Sant Eustachio il Caffe, the Fair Grinds Coffeehouse of Rome, but that’s a longer story for another day or go right to Fair Grinds Around the World. After a lunch with Senator Lucio d’Ubaldo, our very generous host, where we dissected the impact of new requirements for voter identification in the USA and what it might mean for the Obama candidacy as well as the retrenchment of democratic principles. The room at the Ristorante da Sabatino a S. Ignazio, near the Parliament, was far in the back. As I looked on the right was a newspaper report on a meeting that ex-President Bill Clinton had with the Ukrainian Premier in the restaurant and how much he liked the classic Roman pasts, the carbonera. On my left were a dozen Christmas tree ornaments sent over the years from the White House and a framed picture of Barbara Bush with a personal note of thanks to the restaurant’s owners for past pleasures. This was no Tea Party, but a working lunch, but I still wondered what any of us would think about spending our tax money to send these baubles over to this fancy restaurant in Rome. Senator Ubaldo is with the more liberal Democratic Party, but after a tour of the Senate (and, yes, there is a mural of the Roman Senators from thousands of years ago in debate that rests on a wall over the modern Senate meeting spaces! 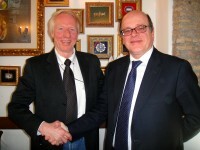 ), he introduced us to the his more conservative colleague, Senator Baldassarri, who heads the Finance Commission. We had a most engaging conversation with Sen. Baldassarri, who also carries around a Phd in Economics from MIT and a thesis signed by three Nobel prize winners from Paul Samuelson to more recently Paul Krugman. He argued in elegant English that we should not be confused by looking at the Greek crisis as if we were “looking at a finger and didn’t realize it was pointing at the moon,” meaning in his words the financial mess in the USA and the huge debt now owned by China. Importantly Sen. Baldassarri understood ACORN International’s Remittance Justice Campaign immediately, making this meeting invaluable. I made it through my presentation on Democracy in the XXI Century, with no huge problems, despite the fact that the broadness of the topic was wide enough to crush me with its weight. Great questions from both long time observers of the US and other countries and smart-as-a-tack younger professors and policy people. Very engaging! Rome A great adventure and advantage of my work is getting to see parts of a city that even long time residents cannot imagine. I may not see all of the sites in the tourist guide books, but I see amazing things where people live and work behind the walls of most visitors. On arriving in Rome Saturday afternoon, Senator Lucio D’Ubaldo gave me a ride into the city since he was landing at roughly the same time. He insisted before visiting over lunch that I see some of the massive fascist architectural projects around the EUR district that had been largely abandoned with the advent of WWII, but were still deeply planted as governmental facilities in this very upscale Roman neighborhood. Being largely ignorant of these Mussolini-era projects, it was both fascinating, education, and almost frightening in its symbolic scale and ideological power. 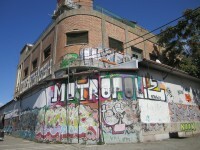 David Tozzo of ACORN Italy and I had a different reaction on Sunday afternoon as we spent several hours touring “Metropoliz,” a “squat” and cultural project in a massive, former pig slaughterhouse in the eastern part of Rome. We had been introduced to this project through connections made with some of the volunteers helping ACORN International who were part of the graduate design and architectural projects at University of the City of London, and had promised to check it out during my visit. About 100 people, who had been evicted or were homeless, were living permanently in Metropoliz. Immediately I could recognize Peruvians from my many visits to ACORN Peru, and seeing one section painted Peru Piazza only confirmed what I already knew. Other permanent squatters had come from Senegal and other countries as they were evicted from place to place. In a adjoining building were another 100 Roma who were not part of Metropoliz, but in the same soup. Over the two years of this experience various artists, designers, and others had joined forces with the squatters in a way that was not clear to me, but had evolved into a documentary film called Space Metropoliz. 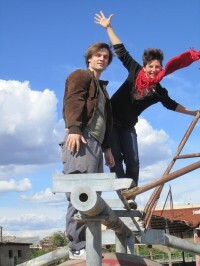 There was a large, homemade telescope at the top of the plant tower. A friend explained that three “balls” from the plant were imagined as the base and that they were working with the squatters on a p roject of “imagination” to build a rocket to the moon on top of that construct. I had some trouble following all of this, but perhaps that was the point, since the designers and cultural workers were trying an experiment to see if diverse people at Metropoliz could come together on an “act of imagination.” The film would document that effort. Asking what would happen after the film was finished, I was told that that was a good question, which didn’t comfort me much. It seems that the future is also “part of the experiment” to see what the squatters will make of it all later when the film is over. I suppose that once again the rocket may hit earth with a loud and resounding thud. Who knows? The space was mammoth, and in Italy access to water and lights are allowed for humanitarian reasons by the public utilities (amen to that! ), so people were fashioning reasonable living quarters in some of the areas. Others were jumbles of graffiti and mayhem. 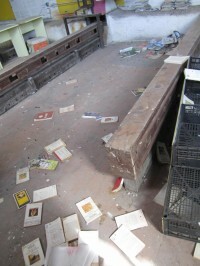 The former “classroom” was little more than rubble with books thrown on the floor. 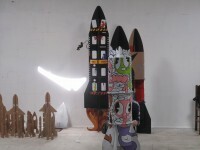 The most finished area was where the “rockets” were being painted by professional artists and some of the children. As we were walked around on a gorgeous Sunday afternoon with a breeze in the air and the first hint of fall everywhere, we could tell by the steady stream of people who seemed to be going and coming that Metropoliz was something of a happening. The permanent squatters were sanguine about all of that and largely ignored the outsiders and their trooping around cameras in hand. This was not industrial tourism but a sort of “developmental tourism” almost similar to what we had seen in the recycling area of Cairo. Ther e seemed to be potential everywhere, but problems almost as large. According to our friends from UCL, this is one of a number of similar squats around Rome. It’s an interesting phenomena and worth a look. I’m skeptical about how all of this plays out, but was filled with good wishes and hope for all involved. Why not? Something good can happen here that wasn’t possible before hand.